Last week I borrowed Erika’s pink tulips in Ohio and put the vase outside in the snow to photograph the contrast. Perhaps you saw that post. My sister is the one who said, “Buy Spring flowers like the Germans did when you lived in Germany” and I took her advice. This morning I went to the market to get some fresh produce and a bunch of tulips was 4.99 which I thought was well worth it. They’re from Virginia. What a different feeling a bouquet of Spring tulips can bring to your spirit. “We lost an hour of winter”, Mary told me when we set the clocks forward. This afternoon the sun came in through the dining room window but it didn’t hit the table so I put the vase on the floor to catch the light. Hope for Imminent Spring could be another title. I hope it reaches you soon! Beautiful photo! It is totally spring here. Azaleas are in full bloom, 80 degrees today! Good-bye winter. 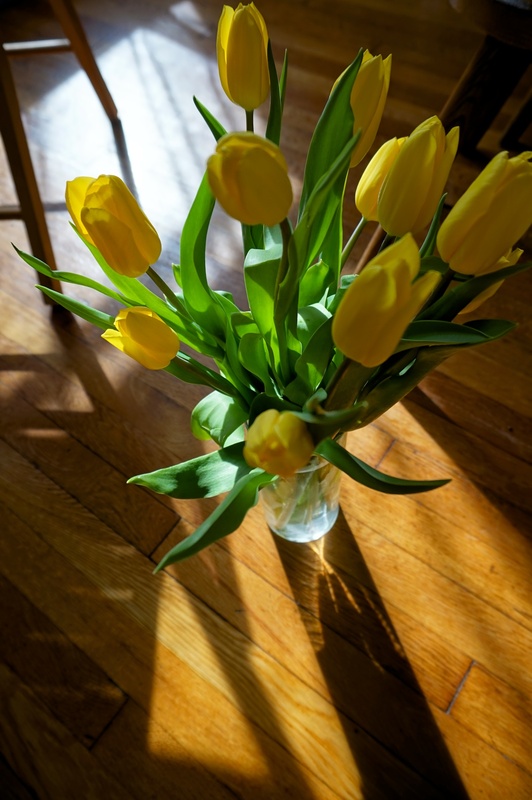 Well – the beautiful tulips in the “almost spring sunshine” made me smile. in the house happier! But, I do miss Michael bringing me flowers from a roadside stand on his way home while we were in Germany!! And – thanks for sharing the penny tip. Can’t get enough tulips! Thanks —— keep the photo up all day, maybe for a few days!!!! “Hope for imminent spring” – now THAT’s perfect!! The tulips are beautiful and beautifully captured. We had a spring day with short sleeves today – Woo Hoo – it’s time!! !